This NUDGE hiking adventure takes you to the beautiful west coast of Scotland. During the hike you will cover kilometers of lush, highland countryside dotted with lochs, quaint Scottish villages, and the beautiful highland glens. 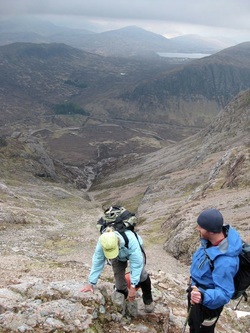 The excursion consists of a mixture of walks and physically challenging climbs (not mountaineering technical) along some of the better sections of the West Highland Way. On this most memorable and rewarding adventure you will view some of Scotland’s most beautiful scenery while climbing up 3 Munros – Ben Lomond, Buchaille Etive Mhor, and Ben Nevis. Below you will find the exciting travel itinerary and NUDGE'S exclusive Endurance Training Program for this once in a lifetime adventure. Day 1&2: Arrive in Glasgow in the morning. We will spend two days and two nights in Glasgow to adjust to the time change. During this time, we will have an opportunity to tour the city with all of its museums and historical buildings, not to mention the local culture and pubs. Day 3:Transfer by coach or minibus to your Hotel at Rowardennan, on the banks of Loch Lomond, nestled at the foot of Scotland's most southerly Munro, Ben Lomond. Day 4:After a traditional Scottish breakfast, your guide will lead you directly from the Hotel on a climb of Ben Lomond (3,195 feet, 974 metres). The guide will choose the best route up and down to suit your party. From the summit, there are expansive views south to the central lowlands, north along the entire length of Loch Lomond, and range after range of the beckoning highland mountains. 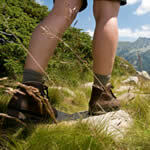 Day 5:Most of the day is spent on a self-guided walk along one of the best stages of the West Highland Way. Starting at the Hotel, you walk from Rowardennan to Inverarnan (14 miles, 23k), where you should have time to stop at the famous Drovers Inn for a few late afternoon refreshements. After that, your coach or minibus will arrive with your luggage, and transfer your group to your next Hotel in Glencoe in time for your evening meal. Day 6: Another guided hike on the West Highland Way. After breakfast, your coach or minibus will take you on the 10 minute drive through Glencoe to the start of the walk over the Devil's Staircase (9 miles, 15k) to Kinlochleven. After the hike, you will have plenty of time to enjoy a couple of hours in the village before you are collected and taken back to your Hotel in Glencoe. Day 7: Enjoy a well desrved free day in Glencoe. Relax in this magnificent setting with plenty of options to enjoy the local culture: visit the local folk museum or the site of the famous Glencoe Massacre. Alternatively, try one of the many local walks, take a bus trip to Oban ( the nearby fishing port and stopping off point for the Western Isles), or just relax around the Hotel. Day 8:Meet your guide at breakfast and take a short bustrip through Glencoe to the Buchaille Etive Mhor (the big shepherd of Glen Etive). This is one of the best known peaks in Scotland, which may look forbidding yet has a relatively easy route to the summit. Once on the summit (3,350 feet, 1,021 metres), enjoy fantastic views over Rannoch Moor to the south, and across the Mamores to mighty Ben Nevis in the north. After your walk, you'll be driven back to enjoy an evening meal, and your last night at the Hotel in Glencoe. Day 9:A self-guided walk on the final section of the West Highland Way. After breakfast, you will be transferred the short distance to Kinlochleven. From there you have a fine day's walk through the mountains (14 miles, 23 km) before reaching Fort William at the foot of Ben Nevis. Your accommodation in Fort William will be at selected guest houses in the east end of the town, close to the end of the West Highland Way and the start of the climb of Ben Nevis. We will recommend and book evening meals at one of several good restaurants in Fort William. 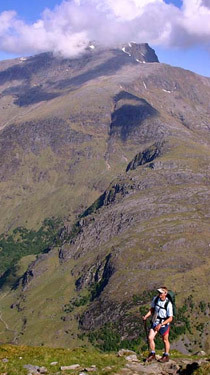 Day 10:You and your guide will be transferred the short distance to the start of the climb of Ben Nevis. As you are starting from near sea level, you will be ascending almost the whole height of the mountain (4,409 feet, 1,344 metres). A long, but exhilarating day should give you a great sense of achievement at the end of your trip. Day 11:We will transfer you by coach or minibus from your accommmodation to Glasgow in time for your depature the following day. Please click here to see some of our other NUDGE Adventure Training Programs. Or, let us work with you to design a program that suits your needs and budget.